With many great features and potential applications, this all-in-one Advance Tabco PRU-24-60R Prestige series stainless steel Uni-Serv speed bar will serve as an essential part of your high volume restaurant or bar operation. Items found within the Prestige series of underbar equipment line up perfectly with each other, creating a uniform look across any bar. In addition to a number of eye-catching features, this speed bar boasts an exclusive twist-action leg assembly for added strength and an extended backsplash to create a truly one-of-a-kind unit. This unit features a 30" x 11" insulated ice bin on the right side and boasts an 89 lb. capacity, while a recessed drainboard with a removable perforated top allows for glassware storage. 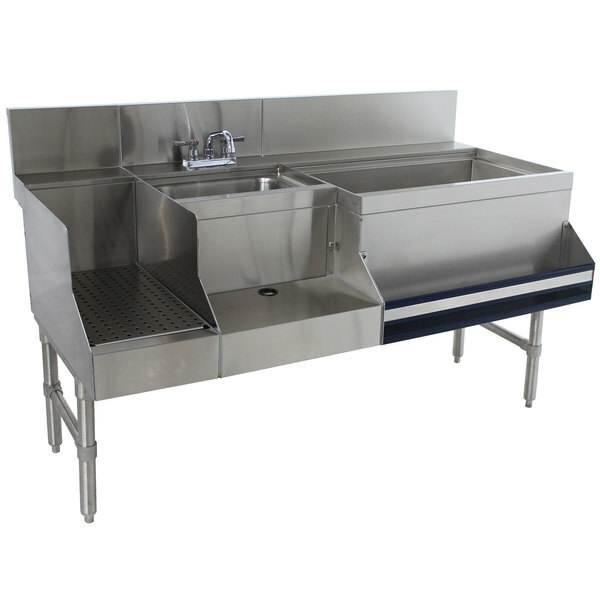 Additionally, a 16" x 11 1/2" x 6" dump sink with a deck mount gooseneck faucet sits conveniently behind a recessed dual blender and mixer station. To complete the mixer station, a 15A/120V duplex electrical outlet is hidden beneath the shelf to provide a handy power supply. The speed bar includes a 3 1/2" basket drain for the sink bowl and two removable plastic bottle racks for extra storage. Other features include a 7" backsplash, 30" built-in speed rail, 1 3/4" return with soda gun knock-out, and 1" IPS drain.